Jamaica is blessed with an abundance of water, including a number of cascading waterfalls where you can actually climb up the waterfall. The most famous is Dunn's River Falls, near Ocho Rios on the north coast. Dunn's River Falls is 1,000 feet high, and the rocks are terraced like steps. Lagoons are interspersed among the rocks. The falls are continuously rebuilt by deposits of travertine rock, and geologists call Dunn's River Falls a living phenomenon because of this rebuilding. Dunn's River Falls empties into the Caribbean Sea, and this makes it one-of-a-kind in that region. Virtually all resorts offer tours to Dunn's River Falls, and the easiest and most common way to get there is by bus. Dunn's River Falls is such a big draw in Jamaica that the parking lot is a vast sea of tour buses. You're likely to find many vendors near the tour buses. When you ascend the falls you'll almost certainly be in a crowd of climbers. You'll be sorted into a group along with some of the other climbers, and every group gets a guide. The guides will tell all in the group to hold hands, and up everyone goes, linked together. Bring aqua socks if you have them; rentals of these handy footwear items are available, but they cost nearly as much as a new pair at home. An alternative is to wear sturdy rubber sandals with firm tops and a back section around the heel. Even with the crowds, the walk up the waterfalls is lots of fun. Guides helpfully carry cameras and make time for photo opportunities of this magnificent sight. But be prepared to get soaked. Bring a waterproof camera if you want to have your own. Many kids make the climb up the waterfalls. A good minimum age for kid climbers is 7 years old, but you should make this judgment depending on how sure-footed your child is. Besides climbing the beautiful Dunn's River Falls, watch the sunset against this stunning and unusual backdrop and enjoy other scenic views toward the horizon. Or have a run on the beach or a walk for exercise around the park. Check out the plants near the falls, which include tropicals like bamboo, croutons, ferns, ginger lilies, orchids, and a variety of palm and breadfruit trees. There's a cafeteria in the park that serves jerk chicken, pork, and fish for a true Jamaican meal and also snacks. Or you can bring a picnic and cook your favorites on grills scattered around the park. 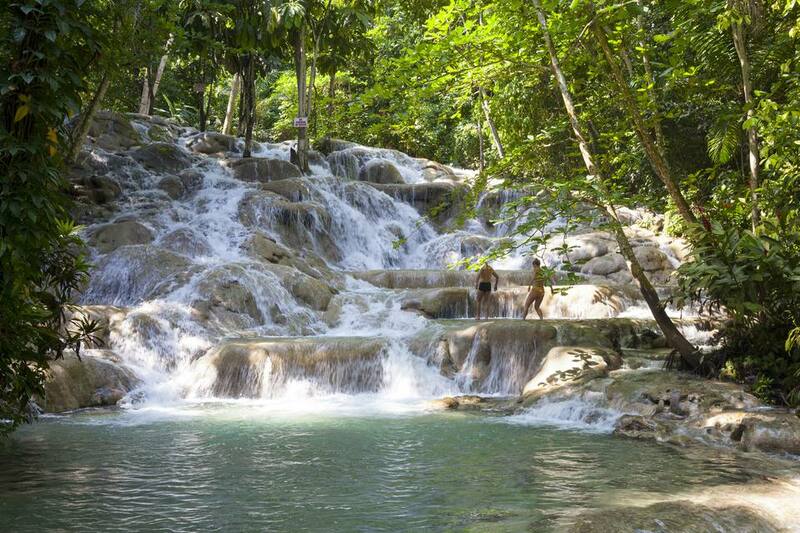 For a quieter waterfall experience, try YS Falls in the southwest, about an hour from Negril. YS Falls has seven waterfalls that are surrounded by gardens and trees, making for a spectacular experience. The beautiful Mayfield Falls consists of 21 small cascades on the Mayfield River in Glenbrook Westmoreland, Jamaica.